O. Winston Link (1914-2001) was one of America's most exceptional photographic artists. 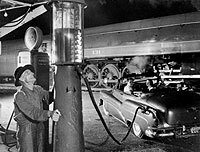 His meticulously composed, nighttime images, made primarily during the Fifties, celebrate the last days of steam railroading in this country and today are widely regarded as icons of 20th Century Americana. 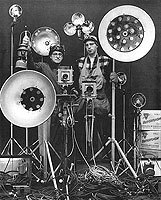 Public recognition of Link's unique talent came late in his life, however, when more than forty years later books of his photos were published. Today there is an O. Winston Link Museum in Roanoke, Virginia—the only museum devoted to the work of a single photographer—and his original prints sell for thousands of dollars to collectors, while railroad and photography buffs can purchase O. Winston Link postcards and calendars. 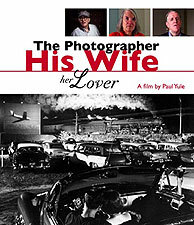 Behind this success story, THE PHOTOGRAPHER, HIS WIFE, HER LOVER reveals a bizarre tale of deceit, lies, lust and greed, one involving the adultery of Link's much younger wife and business manager, Conchita, and her imprisonment for embezzling his wealth and stealing more than a thousand of his original prints. In addition to many of Link's best-known photographic images, THE PHOTOGRAPHER, HIS WIFE, HER LOVER features interviews with O. Winston Link, his former wife, Conchita, her lover Edward Hayes, Link's younger brother, his son, photo dealers, the Link Museum director, and attorneys involved in the criminal prosecution. Ambiguities and uncertainties abound, however, as we hear the conflicting but seemingly credible accounts of the protagonists. Was this a case of a younger wife who cheated, sexually and financially, on her old, sick husband or that of a scorned wife who was disinherited by a vengeful and physically abusive husband? THE PHOTOGRAPHER, HIS WIFE, HER LOVER is finally a story about the loss of innocence. As a compelling account of the lurid background to one of the great art scandals of modern times, it dramatizes the contrast between what Link's extraordinary photos represent—especially the nostalgia for an idyllic but long-vanished American experience—and the venality and criminality that these now highly-prized photos generated.